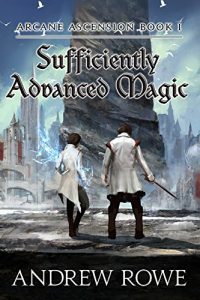 Sufficiently Advanced Magic (SAM) is currently a finalist in this year’s Self Published Fantasy Blog off (SPFBO) and you can find out more about the initiative by clicking here. This is, in fact, the reason I picked it up. It’s not my usual cup of tea, but I’m reading all the finalists this year and I’m glad I made the effort. So SAM is the result of taking Kvothe, Hogwarts, Diablo (the video game), and anime (in general) and throwing them all into a blender. OK, not really, but it’s not that far off. 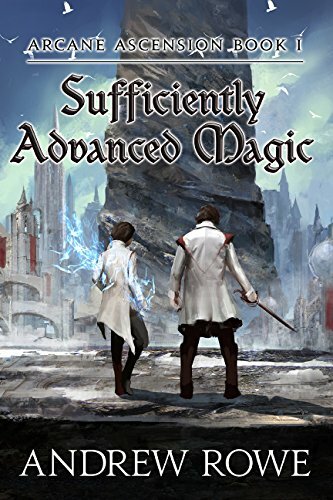 The main character is very Kvothe-like (though not quite as annoying), the school is very Hogwarts-like (and not just because it’s a school that teaches magic), the magic system is very video-game like in its mountainous detail of attunements and tiers and levels, and there’s anime influences ALL over the book. Yes, I see you, Itachi and your Sharingan all over that epilogue. None of this is a bad thing, I’m just drawing all the customary comparisons in one paragraph. The story follows young Corin Cadence in a 1st person PoV. Corin is not your usual hero in that he’s not the most combat proficient character (except when he is), and he has a habit of over analysing everything instead of the normal hero trait of jumping straight in with both feet and hoping things turn out fine. His analysis of each and every situation occasionally grated on my nerves, but for the most part he was a serviceable hero, though not the most likable of chaps. Truth is, you don’t always have to be likable. I detested Jalan (Prince of Fools) for 2 books and still loved them, and Kvothe (Name of the Wind) may be my most hated protagonist in all of fantasy yet I still have read both his books. Corin is determined to either find his missing brother, or ask the goddess to bring him back to life in the case he is dead. His brother was lost in the tower years ago. Towers are magical places of testing where people are pitted against puzzles and monsters and can earn magic and items and money for successfully climbing to higher levels. They’re also run by fragments of the goddess who appear to be entirely separate from her. After earning his first magical attunement, Corin then goes to magic school to learn to use said attunement. And from there things go a little sideways as Corin finds himself embroiled deeper and deeper in a spiraling plot that threatens the kingdom, and maybe even… the world! This book was a little more YA (young adult) than I was expecting. I don’t tend to touch the genre because I find it frustrating. And at times I certainly found SAM frustrating, but those moments were overshadowed by the “ooooooh” and “aaaaaahh” moments. Even though Corin doesn’t like touching people or being touched, there’s a fair few periods of him pontificating about his feelings over XY and Z. All in all, a bit more YA than I’m used to, but not enough to put me off. The magic system is intricate. Clearly a lot of time went into designing it, and a lot of time goes into explaining it (it even comes with diagrams in the book). It’s complex and obviously inspired by video game mechanics. At times it feels a little overpowered with people teleporting all over the place, but it fits well within the context of the story and allows for a lot of cool moments. I must admit I found the pacing a little off at times. The book slows right down in the middle with lots of exposition as magic systems and political borders and history lessons are all delivered in the form of lectures, both to the characters and to us. It makes for a few dry chapters, but there’s usually a monster attack or puzzle test for our characters at the end of those chapters which soon makes you forget about the lecture. Pretty cool monsters all round as well, with a large scope for more as the series progresses. The action scenes themselves often feel a bit slow as well due to Corin’s analysis of everything. It sometimes felt like everything was happening in slow motion with plenty of time for him to describe possible outcomes. The writing is excellent. It’s my first time experiencing Andrew Rowe’s own particular style and I felt it fit the story and world very well and did the job nicely. There were a few times I felt a joke or quip was a bit forced, but they were few and far between. And while I won’t go into spoilery details, I will say the finale was blistering and exciting and vivid. There was a goosebumps moment in there so definitely worth the read. I’m giving SAM a solid 4 stars. I really enjoyed it and eagerly look forward to the sequel. If you like video games, anime, or Harry Potter give this one a go right now!